It's time to take your skills with the 'cyber stoppie' game which will test your keyboard coordination to the limit. Get ready to press 'down' arrow after the orange arrow marker & as close to the white board as possible. As you take off, use your 'left' & 'right' keys to shift your weight and balance. 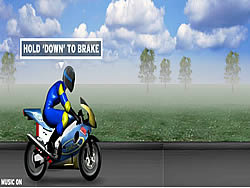 The greater the distance you cover & the longer you hold the stoppie all go towards your score.